Well, perhaps more accurately, discounts matter. That hasn’t always been the conception of selling books. I remember a story years ago that when Robert Half brought up the idea of selling books at a discount (Half later founded the discount chain Crown Books), a professor said that it would never work…because book buyers see them as a prestige item and don’t care about discounts. It can be true that lowering a price can hurt sales. I was a brick-and-mortar bookstore manager, but I also managed a game store. We had chess sets from about $10 to about $500. Ten dollar chess sets sold better for $9.99…but a $500 chess set would have sold worse at $499.99. If you are spending $500 for a chess set, you want the best, you want a work of art…you don’t want to buy a “bargain” item. Clearly, at Amazon, that idea of books being a prestige item isn’t true for the most popular Kindle books. It’s worth noting that this is exactly the concern that the tradpubs (traditional publishers) had when Amazon introduced the Kindle and priced many popular books (not all books) at $9.99 or less. They were worried that there would be “price value perception devaluation”…if an e-book is $9.99, is it justified to put a list price (the publisher’s recommended price) of $25 on the same book in hardback? Sure, they have some different benefits, but that’s going to look strange to casual book buyers, who buy most of the books. this morning, I expected to see a lot of indies (independently published) books at the top, along with traditionally published books by Amazon and other publishers which are not part of the Big 5. As I looked at it, something stood out to me: it looked to me like all of the books were “bargains” in the past couple of days. books. Those are published by Amazon, and are Prime members can get one for free each month. I don’t think those free “sales” count as sales in the bestseller list…and I wouldn’t expect people doing the free downloads to wait until the last day of the month! I do think that the books being featured and getting the number of reviews they get probably do influence the sales. They also normally sell for $4.99, so they are fairly inexpensive. to confirm what I remembered: it had just been on sale for $2.99 as part of a sale to which I alerted my readers of “Red Carpet Reads”, books tied into movies. members can read it at no additional cost. I think those borrows probably do count for sales, since the publisher is compensated for them, but I don’t know that for sure. It was last on a significant sale back in December, but I think the free borrows have helped it. Of course, it has also been selling very well in physical book form, which isn’t affected by that…but we can reasonably include it in e-books that you can get below the list price. Book #7, Everything We Keep by Kerry Lonsdale, is also a KU title. #8? Another Kindle First title. The One-in-a-Million Boy by Monica Wood dropped from $12.99 to $2.99 on February 1st and has stayed there…so it is on sale. That’s #9. #10 is Cole by Tijan, who is a New York Times bestselling author of romances (according to the product page). It just came out two days ago at $2.99. That’s in line with many other Tijan books, so we can’t say this one is on sale or an introductory low price. It appears to be a Kindle indie. I won’t classify this one as on sale, but compared to many tradpubbed books, it is a bargain. I had to go down more than 25 books to find a book which wasn’t under $5, in KU, or that had been on sale recently. That one was Big Little Lies by Liane Moriarty…which is a current high-profile HBO series with Reese Witherspoon, Nicole Kidman, Shailene Woodley, Alexander Skarsgård, Laura Dern, Adam Scott, and Zoë Kravitz. The trend seems obvious, based on this data. What do you think? Has customers’ perception of books changed? Is buying them as bargains now acceptable…even preferred? Does that mean the publishers were right…if e-books had been introduced at the same price as p-books, and if Amazon hadn’t started their independent publishing platforms, would the bestsellers at the Kindle store parallel the bestsellers at Amazon in p-books? Feel free to tell me and my readers what you think by commenting on this post. Do check the price before you click/tap/eye gaze (the last in Virtual/Augmented/Mixed Reality) that Buy button: the prices may not apply in your country, and could change before you read this. Bright Line Eating: The Science of Living Happy, Thin & Free by Susan Peirce Thompson Ph.D.
$8.63 may seem like an odd amount, but there is a specific reason…and it’s a very good one for Amazon customers. This one, though, set a record: a score of 86.27 on a 100 point scale. That’s the highest in 18 years of the poll. The nearest corporation was Wegman’s with 85.41, and Apple was fifth with 82.07. For this audience in particular, it’s important to note that it does not apply to digital content (which includes Kindle books) or Amazon gift cards. I normally take it to work with me, and running it off the battery for the day has been fine. However, it can now go into “hands-free” mode, which is much more convenient. For example, I’ll set a timer for my lunch break, and be doing floor exercises on a yoga mat (often while watching Netflix in Virtual Reality, or reading on my now discontinued Kindle Fire HDX). If the alarm happens to go off while I am in VR, it’s a whole lot easier to stop it verbally than to get out of VR, and climb up to the desk to turn it off. Oh, I should digress and explain that climbing thing. I have a chronic condition which makes it hard for me to get up off the floor, among other things. One time, we were at our favorite dog park, and a blind husky knocked me over. There was a husky club there (they go there a lot), and I just naturally expected the dog to avoid running into me…I can’t change directly quickly, but I could have stopped and made myself less of a “target”. That gets me to about $30…and finding $20 won’t be too hard. Hm…dog treats or a dog puzzle or two would do it. 🙂 I’ll check with my Significant Other as well. Another restriction that will affect my decision: the items need to be sold by Amazon.com, not just fulfilled by them (which lets out some of our dogs’ favorites). For my readers around the world, note that this is for products from Amazon.com…it won’t apply to your localized sites. where you can see all top 100. I didn’t see a single book publisher on the list, although some of the companies may publish books. There were content creators and distributors (including Time Waner at #88, Netflix at #18). The sales goes through 11:59 PM Pacific time tonight. In the USA, today is “Presidents’ Day”. I would guess most kids today see it as a celebration of all of our Presidents, although that’s certainly a recent interpretation. There had been separate holidays for Lincoln’s birthday and Washington’s birthday, and they used to be celebrated on their actual birthdays. Since my birthday happens to be the same as Lincoln’s (February 12th), that meant that as a kid, I got my birthday off from school…which meant I could have well-attended parties. 😉 I felt a little cheated when they combined things into one day…and also put it on a specific Monday (the third), which happens to mean that it doesn’t fall on any President’s actual birthday, I believe. Lots of Presidents have written books, but what I’m concerned with here is the books they read…or at least, that they appear to read. 🙂 Some Presidents have had public statements made about what they read, or what books they buy…in other cases, it’s just come out from what they have said. My first thought is of Abraham Lincoln walking three miles (and there probably weren’t sidewalks and streetlights!) to borrow a book from the library..but I actually don’t even know if that’s true! I took a look online and saw it asserted, but not in a way that seemed anything but anecdotal. However, I have found many references to books Lincoln read…and found comments the 16th President reportedly made about some of them. Then, I found this scholarly work by Robert Bray, which analyzes all of the reported Lincoln books and assigns a probability that the President actually had them…with the highest level being Lincoln referring to them. I’ve seen a quotation attributed to Lincoln commenting on Shakespeare’s Julius Caesar which would be intriguing due to the assassination…but didn’t see it verified. I also saw that Lincoln had read Aesop’s Fables (which is logical, I’d say), but it wasn’t on Bray’s list. On a separate page, they list the President’s favorite books as a child. I’m comfortable with feeling that Lincoln and Kennedy were both “serious readers” (before the Presidency…it might be hard to read much that isn’t for work as President). Then, of course, there was Thomas Jefferson (who reportedly said, “I cannot live without books”). Jefferson supposedly had the nicest personal library in the country, and after the collection of the Library of Congress was burned during the War of 1812 (with the British), Jefferson as an ex-President used that personal library to help re-build the Library of Congress (selling them, not donating them as I understand it), and greatly expanding the scope of the collection. has a list of books TR sent to a friend, even saying that the President has read many of them multiple times. Authors on the list of more than fifty titles include Sir Walter Scott, Mark Twain, and Charles Dickens. I would expect most Presidents to be readers, in part because of the type of background that has in the past led to the Presidency. Supposed you could create a recommended reading list for any future President (not just for any specific one, including the current President). What would be on it? I’m going to make some suggestions, and then I’ll see what you say by commenting on the post. If I get at least twenty suggestions (including my own), and they come from at least five people (including me), I’ll do a poll to let people vote on which ones they would most recommend. Hm…I want to add some fiction, for sure, but I’m going to hold off on that. 1984 seems like a choice, but I don’t think that’s quite it. I also would consider having on the list something like Mein Kampf. As you can tell, I would assume, my thought is to open a potential President’s mine and at the same time to make them more mindful. Culturally, though, I think a knowledge of socially impactful fiction would be important. is one of the best in what has been a great year so far! I’m comfortable with saying that this tenth anniversary year of the Kindle (it was released November 19, 2007) has been the best one for Kindle Daily Deals (or equivalents) so far. I’d be very surprised if a regular reader of this blog hadn’t read a book by at least one of the authors in today’s group…and it wouldn’t surprise me if many of them had already read at least one of the specific books in today’s deal. Just because you have read a book doesn’t mean that the fact that it is on sale isn’t a benefit for you. You can buy the book as a gift at the discounted price and then either delay the delivery for an appropriate gift giving date, or print it out and give it whenever you want. Check the price before you click, tap, or eye gaze (the last in Virtual Reality) that Buy button, because the price may not apply in your market. Seriously, do take a look at this offer today. There are books with literally thousands of customer reviews and rated higher than 4 stars on a 5 star scale. There are books from the Big 5 tradpubs (traditional publishers)…there are definitely what I call “People Magazine books” here, ones which would have been reviewed in mainstream media. Alexa, Amazon’s digital assistant available on the Echo family, current Fire tablets, the Fire TV family, and more, is undoubtedly a big part of Amazon’s future. It is (or can be) already part of our literary lives, reading books to us with text-to-speech (when not blocked by the publisher), playing audiobooks, answering questions about authors and works, and more. Even though there is growing competition (Samsung’s next rumored flagship form is reportedly going to include a new assistant, Bixby, with a lot more capabilities…I took a quick look to see if the name could be inspired by author/screenwriter Jerome Bixby, but I’m not seeing an immediate connection), Alexa is going to be prominent for some time to come. Amazon is spending a lot on development, clearly, and users are getting some good results. 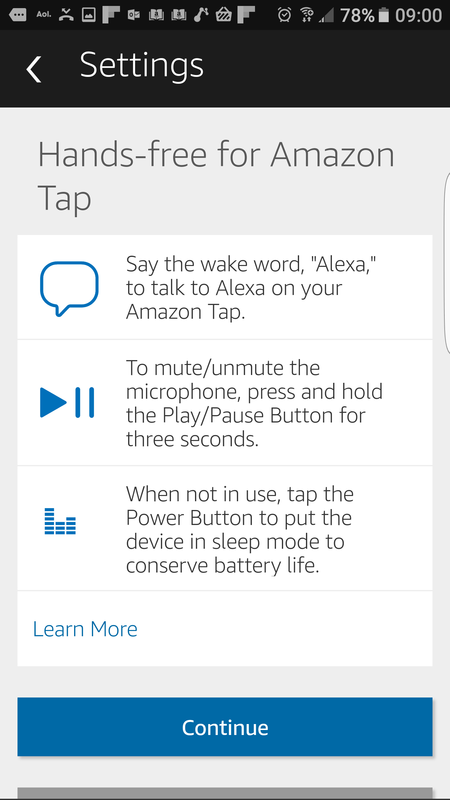 One simple thing: you can now use “Computer” as a “wake word” (what you say to get the device’s attention). People have wanted that from the beginning, because of the Star Trek connection (that’s how people on the Enterprise activate their computer for voice-based interactions). You can change that in your Alexa app and settings. I could choose it for our Amazon Echo and our Echo Dot, but not our Amazon Tap. That’s right: the Tap, which initially required you to push a button to talk to it, can now hear you from across the room, just like the original Echo. Now, as you can see in the above screenshot, they recommend that you put the device into sleep mode if you aren’t actively using it. That’s because listening takes power (as humans know…it’s an active function to be quiet and listen, and it takes energy). The reason why the Tap was portable was because it didn’t listen all the time, to some extent. The real question here is why anybody would now pay $50 more for the original Echo, which can only work when plugged in (although there are some third party battery options). The sound is probably somewhat better, but the Tap can get quite loud. You could also supplement by Bluetoothing or cabling to other speakers…not an option with the original Echo. Do you hear the characters when you are done reading the books? As regular readers know, I don’t “hear” the voices of characters when I read books (and I don’t visualize the scenes, unless they are particularly…unclearlywritten and I can’t figure out what’s happening without that). One of my regular readers who is an expert on reading has told me that’s unusual in someone who reads well (which I think I can objectively say I do), but it’s always been the case for me, at least for decades. Once I found out other people (including my Significant Other) do hear the voices, I was intrigued. was even more fascinating to me. It’s about a study where many people reported continuing to interact with fictional characters (including hearing them) after finishing a book. I am inspired by fictional characters (Doc Savage, for one), but I would describe it as “pull” rather than “push”. In other words, I might consciously think about what Doc might do in a situation, but the character doesn’t appear in my life unbidden. How long does it take to write a masterpiece? It’s based not just on the first book, but on various books in the “Famous Fourteen” original books by L. Frank Baum, and shows a depth of knowledge. There have been a couple of (I think perhaps ill-advised) references to the 1939 MGM musical with Judy Garland, but in many ways, it is closer to the original books. for Kindle delivery October 19, 2017. It should be a bestseller…and if there is another “Game of Thrones” book this year, it could be a very good year for tradpubs (traditional publishers) and brick-and-mortar books indeed. They might also spur more e-book adoption, in part because big books can be a lot easier as e-books…and listening to part of the book may also be attractive. Visual media has seen some real success with returning to older properties in the past couple of years (Star Wars, The X-Files), but I don’t think that necessarily had a lot of impact here. Books often go back for sequels, although that may have been more true with public domain works (there are Dracula sequels perhaps every year). Enough for this morning…I may write pretty quickly, as I said, but I could always write more with more time! Opinions/questions on/about any of these stories? Feel free to let me and my readers know by commenting on this post. yesterday, but today’s has one of my favorite authors. 🙂 I knew Gerald Durrell more from books about collecting (live) exotic animals (I used to travel a lot and I read A Zoo in My Luggage and more at that time), and this one is a bit different…but still involves animals and Durrell’s amusing writing (4.6 stars out of 5 with 134 customer reviews at time of writing). which I have as well, but I think those are all part of KU, so that’s still how I think of them (and there are many more in KU than in PR). This one is also a good one for our “guest bookshelf” on our guest Kindle (for when we have people staying with us). Remember that you can buy it at the discount and either delay it for delivery for an appropriate gift giving occasion, or print it out to give whenever you want. Do check the price (it’s $3.99 in the USA Kindle store at time of writing for all three books in one edition…a big savings) before clicking, tapping, or eye-gazing (the last one is in Virtual Reality) that Buy button…this price may not apply in your country, for one thing.